An Advent Celebration of 31 Crafts and Recipes! or become a yearly support partner. Click here to learn more. 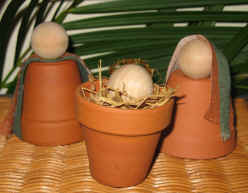 The Clay Nativity is a simple and easy-to-make craft for a broad age range. You will need: 3 mini clay pots (2"), 3 large wooden beads, straw or moss, a gold ring of ribbon or a circle of gold chenille stem, strips of fabric, and tacky glue. Turn two pots upside down and glue a bead on top of each one, (representing Mary and Joseph). Place one of the fabric strips over Mary's head, the other around Joseph's shoulders. Place straw into the third pot, (the manger). Place the third bead (represents Jesus' head) into the straw, then place the gold ribbon or chenille stem around the head for Jesus' crown. For a fun twist on the Clay Nativity, check out our Yard Nativity. Click here.